Project management – is an approach to management of work within the constraints of time, cost, and performance requirements. It is the discipline of planning, organizing, and managing resources to bring about the successful completion of specific project goals and objectives. 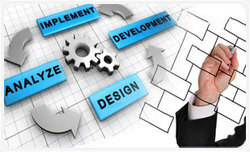 Our company is offering high quality Design Project Management Service as per the clients needs. 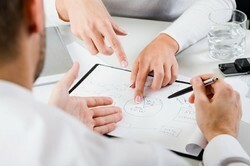 Our services are highly appreciated by our esteemed clients for its completion in promised time frame and flexibility. We are pioneers in optimizing the triple constraints – scope, time, cost and deliver to the assured quality with proven tools and techniques. We are putting forth a selective accumulation of Project Management Services to our important customers. These administrations are exactly offered according to the request of our customers. Notwithstanding this, these administrations are rendered by our accomplished quality controllers. 9 Stones project / Product development, also for niche markets. With high quality criteria and varied language support. A project is a temporary endeavor designed to produce a unique product, service or result with a defined beginning and end (usually time-constrained, and often constrained by funding or staffing) undertaken to meet unique goals and objectives, typically to bring about beneficial change or added value. Cost-effectiveness, high efficiency, best-of-breed infrastructure, and thoroughbred professionals, make LEAN MAESTRO the obvious destination for Outsourcing. Due to our proficiency of this industry, our firm is occupied in rendering Project Management Service. These services are accomplished by industry capable professionals, who have affluent understanding of this realm. Furthermore, we render this service at nominal prices. Our Inter disciplinary approach ensures that all aspects of a project are considered from the start. - Complete Installation of Security system including Fire Alarm system, CCTV.